Clear polypropylene PET blend pouches that stand up when filled with fruit and veggies. They are perforated with holes to allow your produce to breath. Available in clear 2.5 mil PP/PET blend. The small vented produce bags are perfect for tomatoes, limes and small peppers. The medium vented produce pouch bags are great for green beans, snow peas and mini-peppers. The large vented produce pouches are ideal for apples, oranges, green peppers and grapes. 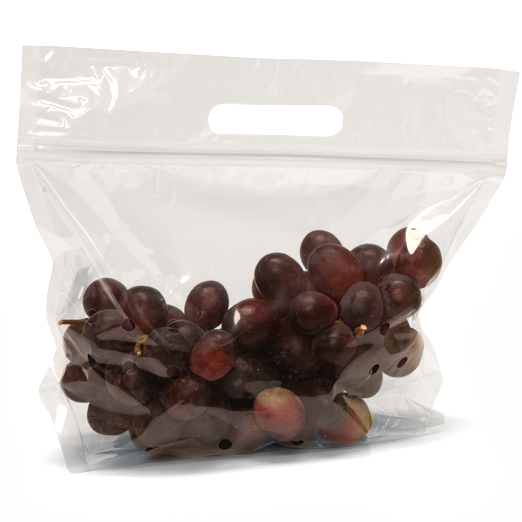 We offer virtually any size Custom Vented Ziplock Pouch Bags.